As with Absolut and Walkers, it's all about flavours for the British chocolate sweet Revels. Each pack of Revels comes with 6 different flavours - chocolate, caramel, coffee, orange, raisin, and - um - maltesers. 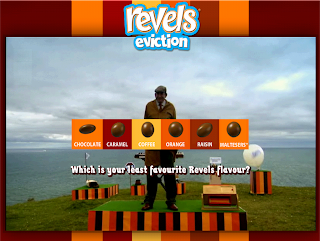 Revels are introducing a new, so far secret, flavour in the near future, so they need to get rid of one of the current ones. (Or have seven flavours - but perhaps I'm not meant to go there). This site very entertainingly runs the whole eviction process. Who goes, and who survives? You decide! I have yet to meet anyone who likes coffee and orange chocolate. Do you think they have done stats on this?! There might be some enthusiasts for coffee and orange chocolate but why not do two type of choloclates coffe and orange - and the other?! I bet you this is something they have spent many hours pondering over ..